The Quad LFO 61B is the second in a series of modules that represents a new approach in User Interface design for Modcan modules. The intent is to combine multiple iterations of otherwise single module functions, in this case an LFO, into a high density module with large feature set that maximizes panel space and control hardware. Here is what it would look like if all the functions of this module where available on the front panel and 8U wide!! All waves have some form of transformation available. Four different Modulation destinations per LFO. Three different Gate Modes per LFO. Tempo Sync with divide is available to set LFO Rate using a clock. Three Global Modes of operation: Normal, Quadrature and Rotate. Three Modes for output wave polarity. +/-5V, 0-5V+, Inverted. Memory storage to save user configuration. 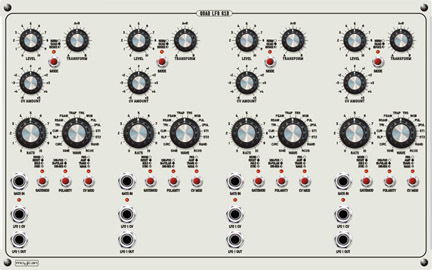 This design uses a "paging" interface with four individual LFOs that are edited by a common set of 6 panel control knobs and 5 switches. The LFO EDIT knob selects one of four LFOs to edit. The knobs become "live" for that channel with the final edit settings stored to non-volatile internal EEprom memory. All settings are automatically restored on power up. Normal: Each LFO is is edited individually. All Modulation routings and RESET options are controlled by panel switch settings and knobs and stored to memory. Quadrature: Only one LFO is active but the other three outputs are 90,180,270 degrees out of phase with the primary out. This is great for quadraphonic panning using a 4VCA or Quad cross fading of four signals. Can also be used to sequence envelopes and a variety of other unique patches. Rotate: This mode rotates the 4 LFOs to the 4 outputs A pulse/clock train on the GATE IN jack increments the outputs one jack to the right with each new pulse. The LFOs can be edited and all modulation routings and settings are retained. The Status LEDs remain static to help with editing. This can produce some truly chaotic patches with a vast array of modulation possibilities. Each LFO has a CV input for modulation. The CV input is routed to the 4 modulation destination by the CV MOD switch. Destination are RATE, AMPLITUDE, TRANFORMATION and WAVE selection. All 4 destinations can be assigned and used simultaneously on all 4 channels. A unique set of functions is available using the GATE MOD input. One GATE MOD setting is available per LFO. Hold: Gate high holds or freezes the current LFO wave state till goes low resuming oscillation from the hold state. Sync:Very unique feature that synchronizes LFO Rate to an external clock or other LFO. This is a great method of keeping LFOs in sync with sequencers etc. In SYNC MODE the RATE knob is used to set the sync division from 1-10 of the input clock. Each LFO can be set to a different division value creating a very powerful rhythmic source that can used to generate a wide variety of synchronized modulation sequences and beat patterns. Also SYNC division is Voltage controllable allowing division variable to be modulated by external or other LFO channels for even more complex patterns. 1 section of 4VCA and One envelope generator. No effects or sequencing. The main clock was supplied by the LFO itself. The other channels were sync divided from the main channel.